This walk: 2012-10-31. West Blackdown car park, modern B/MT boundary stone, West Devon Way, National Route 27, Shetland ponies, Was Tor, old railway line, site of Lydford station, ivy, post box, Wastor Farm, kissing gate, walled garden, white-faced Dartmoor sheep, Burnville Farm, Langstone, The Smithy, wheelwright's wheel, old railway bridge notices. Link to Google Satellite view of the area - the car park is near centre-bottom of the map. In 2000, some new stones were erected to mark part of the boundary: B = Brentor Parish. "..... The boundary changes of the 1880s (ecclesiastical boundary change 1883, civil boundary transfer 1885) transferred the detached portion of Lamerton to the Parish of Brentor, more than doubling its size and population. Further boundary changes in 1987 saw the area east of the 'White Lady Waterfall' on the River Lyd transferred to Lydford parish and Blackdown, up to the road, transferred to Brentor from Mary Tavy parish." "1 April 1987 saw ... the creation of four new parishes in the Borough of West Devon .............. Dartmoor Forest, Lydford, Sticklepath .............. Gulworthy." p.187. "Brentor's bounds, too, were changed in 1987, but parts are still those of Saxon origin. .............. The 1987 changes involved the loss of a portion of land to Lydford north of the River Lyd, and the acquisition of a thin strip of land on its eastern boundary" p. 190. The stone above seems to have accumulated quite a lot of new growth since it was photographed on 2nd August 2012. MT = Mary Tavy. Has this stone been partially cleaned? Along this way is also the Sustrans National Route 27 for cyclists. Another modern boundary stone at SX 49621 82107. General view along the early part of the walk, the area beyond the long Molinia grass is where the old railway ran - we are just about 500 metres from Lydford station here..
A shallow stream crossing along the way. Miniature ponies, not looking very happy. Was Tor, SX 50000 82958, elevation 253 m (830 feet). The building is the former Methodist Wastor Chapel, currently for sale. Looking south over a railway bridge at SX 5023 8310, the site of the former Lydford railway station ..... there are two bridges here, where the lines run close to each other, with scope for confusion. I must go back and sort things out for myself! The station, known then as "Lidford", was opened on 1 June 1865 with the Launceston and South Devon Railway, a 7 ft 0� in (2,140 mm) broad gauge line that connected with the South Devon and Tavistock Railway to offer a service toPlymouth Millbay railway station. This line eventually became a part of the GWR. On 12 October 1874 the LSWR line was opened from Okehampton railway station. This was a 4 ft 8� in (1,435 mm) standard gauge line that carried trains direct from London Waterloo station, whereas passengers to the GWR's London Paddington station had to travel on the branch line to Plymouth and then change onto a main line train. On 17 May 1876 a junction was opened between the two lines and LSWR trains could now reach its new station at Devonport by running over the GWR's route, which was now mixed gauge. On 1 June 1890 a new line, built by the Plymouth, Devonport and South Western Junction Railway, gave the LSWR a route to Devonport independent of the GWR. The GWR line was converted to standard gauge on 20 May 1892. The connection between the two lines was removed in 1895 but was replaced in 1943 to give flexibility should the railway lines around Plymouth be damaged by World War II bombing. Other connections were installed at Launceston railway station and at St Budeaux. Flower head with no flowers accessible for fertilisation, already forming fruits - which become black berries. Postbox, seen along the way. A narrow back alley seen along the back of houses at SX 50180 82971. Farm Cottages sign - I'll bet the labourers who occupied them in the past would not recognise them today! Kissing gate, after passing through the Wastor Farm buildings. Probable Acer palmatum, leaves turning red in autumnal colours. Walled garden at Burnville - at the time of writing, community growers are sought. Whiteface Dartmoor sheep with a possible "mule" (Scottish Backface cross), or is it just muddy? Just a short distance back up the road - what is it? 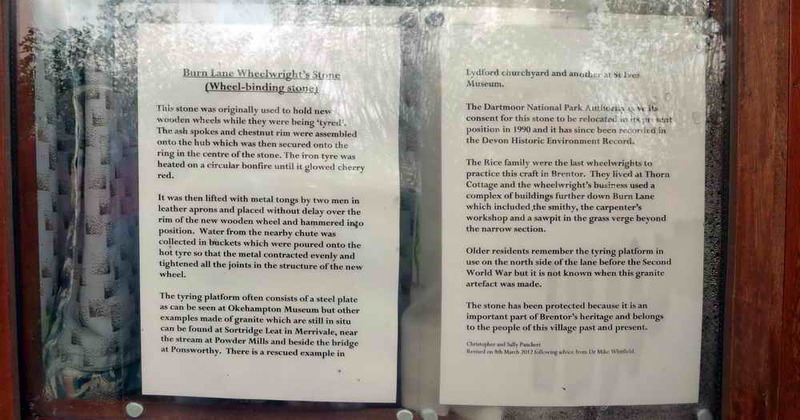 Story of the Wheelwrights Wheel - the reflections are of trees behind the camera reflected by the window glass. Click the image to see a larger version that you can read easily. One of the buildings associated with the old blacksmith and wheelwright. nearby was the sawpit.. The Great Western sign in the previous photograph is seen on the top of the pipe-like structure just before the stone-built bridge parapet, on the left side, above. Again, there are two bridges at this location, one over the GWR and one over the L&SWR. The bridge above is the northern-most of the two and is over the GWR. The following notices were on the second (L&SWR) bridge. Another sign, ending with "3/4"? 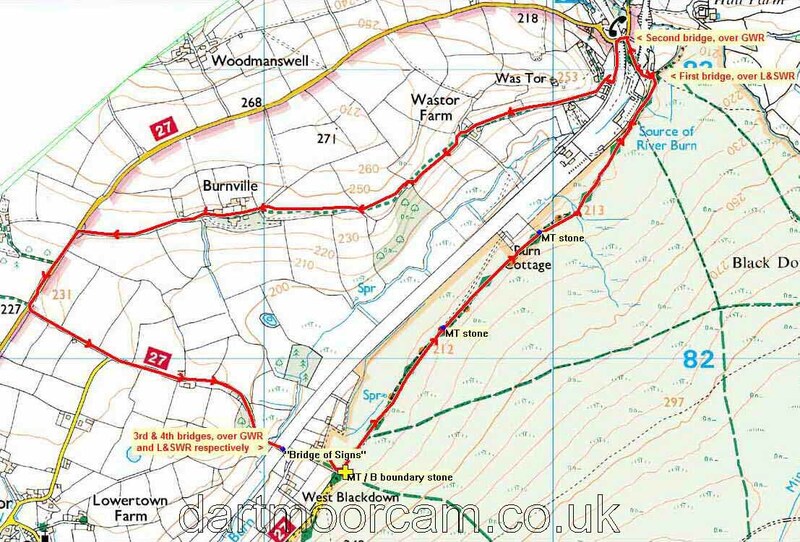 This walk was reached by turning north-west in Mary Tavy beside the CJ Down garage/coach company, then following the road around to Furzleigh, turning right just before the cattle grid, then following the road to a sharp left bend. There is parking on the right, on the hard standing just beside the bend, at the yellow cross on the map. The 2nd yellow cross (at left edge) shows the car park for Brent Tor church. Distance - 6.21 km / 3.86 miles.